Enrico's Biscotti is one of the treasures of our town, and is surrounded by legends, myths, and stories, passed on by word of mouth from person to person. 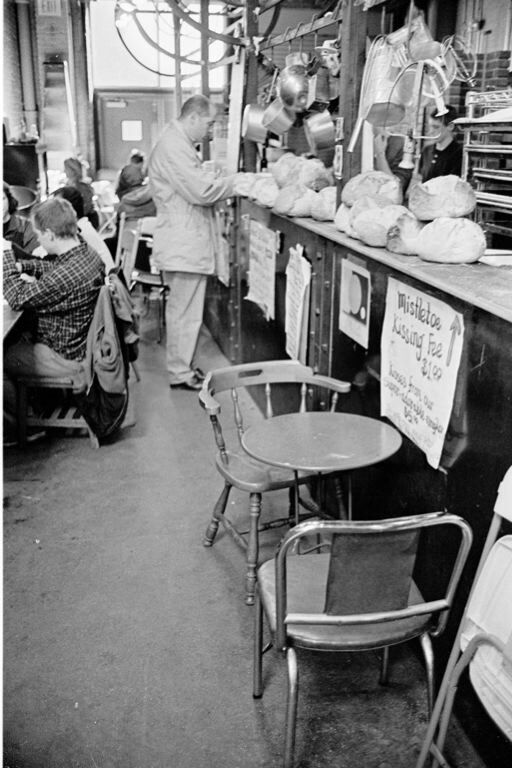 When they stopped selling daily lunch in the back room -- a converted auto garage -- in preparation for opening their trendier Shadyside location, I was depressed for a week. Recently, the back room opened again for lunch on Saturdays. With visions of beans and greens dancing in my head, or perhaps a simple pizza margherita, I stopped in last weekend, and now have a story to relate. We were sitting next to a woman from California who was eating her way across the USA; in fact, she had with her a copy of Jane and Michael Stern's Eat Your Way Across the USA, and Enrico's was listed as a must-stop destination. Larry, the owner, saw the book and stopped to chat. He told her a story. This is the story he told. "So, I'm in the kitchen slicing biscotti and this guy walks in and says 'Are you the owner?' And of course, my reaction is 'Uh oh, something is wrong.' So I slowly put the knife down and he says 'I'm Michael Stern,' and just then my hand slips and I slice my thumb half open. 'Michael Stern? I'm such a huge fan of yours!' And now I'm worried that he's going to think I'm a dork who can't even handle a knife so I just kind of cross my arm and tuck my thumb up under the other arm and try to act casual, you know? Like I'm not bleeding all over the place. So we talk for a while about the business, and about the biscotti, and everything, and we set up a meeting for that evening so he can interview me on tape for The Splendid Table." "So he leaves, and I take my thumb out from under my arm and scream, and my apron is sopping wet with blood. Apparently, while I was just acting as if nothing happened, blood was pouring out of my thumb. He had to have noticed. Apart from bleeding a lot it was actually OK -- after I bandaged it up it healed just fine"
"That night he comes by and we do the interview, and I show him the place, and we're having a great time -- he's just a great guy, a fabulous guy -- and we're finishing up, and he's about to leave, and he looks at me and kind of smiles and says 'So, how's that thumb?' So then I had to explain how I didn't want to look like a complete dork, and we both had a good laugh about it." If you're in Pittsburgh, you owe it to yourself to visit Enrico's. On a cold winter morning, the smell of biscotti and macaroons that drifts onto Penn Avenue from their front door is like a message from another, better world. Their pizza -- traditional Napolitan style -- is thin and understated and fantastic. Their "big fat salad" is a full meal without being offensively built. Their soups, stews, and quiches are hearty and simple. This is peasant food from a magical land where the peasants eat better than everyone else. You can eat at Enrico's every day and never get bored. Jane and Michael Stern's book Road Food is available at Amazon. The movie The Bread, My Sweet was produced by Larry's wife, and was filmed at (and some would say is about) Enrico's. The Splendid Table has a short review of Enrico's on their web site. If you have RealAudio you can listen to the broadcast. The Enrico's piece starts at 8:11 in the stream.